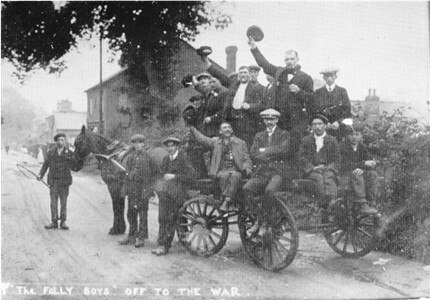 "The Folly Boys Off to the War"
The Folly is an area of old houses built half a mile outside Wheathampstead village centre. It would at one time have been cheap workmens’ dwellings. Not so now as the houses have been modified and upgraded to become desirable residences. Alongside the road out of Wheathampstead towards Luton was the site of the Folly Methodist Chapel, built 1887. 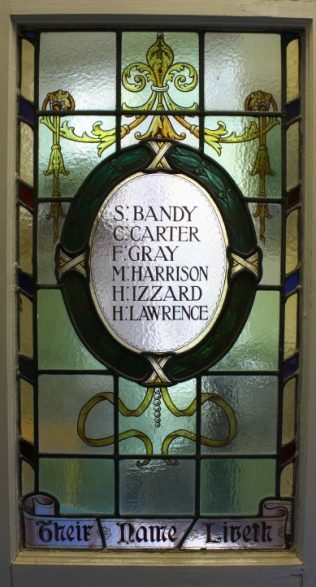 It housed two stained glass windows in memory of the boys from the Folly who died in the First World War. There are no details in the chapel minutes to tell us how the names were draw up or indeed when the windows were fitted. It was certainly well after the First War as one of the men who died from war injuries, did not die until April 1921. The chapel was demolished about 2006. The windows formed part of the general recyclable building material and were advertised on eBay. They were bought for £120 by a lady who thought it an absolute tragedy that these men, who had fought so bravely, and of whom the windows said that ‘their name liveth for evermore’, were obviously not being remembered. She held on to them for some years, trying to find an appropriate home for them, and eventually heard about our War Memorial Project and offered them to myself and then to St. Albans City Museum where they now reside. The names listed on the Folly Methodist Chapel Memorial Windows. Died 15th April 1921. Husband to wife Maud and father of four children. Discharged 1919 as medically unfit. Died a lingering death probably from TB. He will be remembered on a new plaque to be added to the Wheathampstead War Memorial. Died 26th November 1914 on board HMS Bulwark, blow up in Sheerness harbour, from an error in the magazine. Not enemy action. Died 24th October 1918. Francis was the second of three sons of George and Mary Gray, who lived at Cherry Trees in Wheathampstead. His dad was a railway labourer, farm labourer and later a gravel digger. Francis became a domestic coachman and in 1899 married Florence Kate Burgin in Hemel Hempstead and moved to Bovingdon, where in 1911 they are found living at Green Lodge Stables with their children Albert, aged 10, George, aged 8, and one-year-old Marjorie. Name to be added to the war memorial. Died 11th April 1915. He was born at the Folly. In the 1911 census Murray, then 18 years old, is lodging in High Street, Bedford, and has a job as a draper’s shop assistant. Name to be added to the war memorial. Died in hospital in Rouen on September 6th 1918, aged 20. Listed on the window as H. Lawrence. “H” for Herbert which was never Bertie’s name. He died on the third day of the battle of the Somme 3rd July 1916. Died 29th March 1918. Son of Edward & Elizabeth Minall of 49 New Farm, Station Road, Harpenden. He is not on the Wheathampstead memorial as he is listed on Harpenden’s War Memorial. Died 31st July 1917. Albert lived at Cherry Tree Cottages at the far end of the Folly. Died 23rd September 1917. Albert was just 21 when he was killed on September 23rd 1917, when 12th Battalion was involved in the Battle of the Menin Road Bridge. Discharged in June 1916 after a medical board declared him “medically unfit”. Died 3rd October 1916. He was 24 years old. Name to be added to the war memorial although he was technically not a soldier at that time. Died 5th May 1915. Captain in command. Killed in a gas attack defending Hill 60. Died 31st July 1917. Married wife Louisa in Paddington, London, in 1906 and they had a son, Edward George, aged 10 and daughter Elsie Louisa, aged 8, living at The Hill, Wheathampstead when he died. More details and picture of the above names are available in the book “More Than Just a Name” by Terry and Margaret Pankhurst. This tells the stories of all the soldiers of both World Wars in the parish of Wheathampstead Hertfordshire. Available from Terry Pankhurst at, terence.pankhurst@btopenworld.com 243 pages, mostly colour, price £15. Hello I’m hoping someone can help me. I’m currently working at number 12 at the Folly Fields And I have come across a WW1 medal which I found underneath the old wash house shed base that used to be in the back garden. I have also found some old intact bottles believe to be from 1901 /1920 I would be grateful if somebody could get in touch as I can only imagine this medal belongs to one of these lads on that window. Hello Joy, hopefully you will get this message. My name is Kris Schug, I used to live in number 2 Marshalls Way between the early 1980’s and the mid 1990’s with my Mum and Step father. I remember your Father Les, and I think you and your family that lived with him too? My reason for contacting you is, for years I have been extremely interested in local history , especially the Folly, Cherry Trees & Marshalls Heath , as my family have lived in the area for generations. The Folly chapel always held a fascination with me and it was sad to see it go, members of my family worshipped there too, and my Great Grandmother’s brother, Bertie Lawrence, was one of those commemorated on the windows. I would dearly like to see photographs of the memorials you have in your possession, if you would be kind enough to share? Also I’m trying to compile a story for a local publication regarding three local lads who signed up together and served in the Great War, one of the trio being Harry Smith (your Grandfather Cecil’s brother) I have found Harry’s service records online and also Cecil’s. My parents (Leslie & Elsie Smith, nee Hunt) were active in Folly Methodist Chapel all their lives. Leslie was organist for 70 years from the age of 11, having been taught on the organ at St. Helen’s Church, Wheathampstead. I was brought up going to Sunday School at Folly. 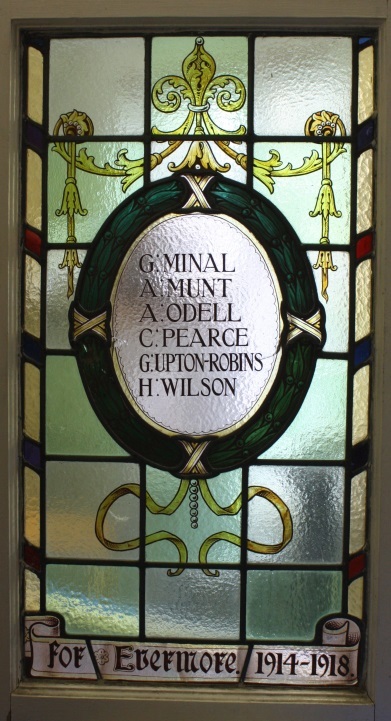 When the Chapel was sold and due to be demolished, I purchased the other two memorial windows – to Henry Smith and Arthur Hunt. They are currently displayed in our home in Manningtree, Essex. My grandfather, Cecil John Smith, started a building company after the first World War and built most of the houses in the Cherry Trees area, all of the estate towards Batford and the council estate at Marford, Wheathampstead. Smith Bros built the rooms behind the Chapel (the hall in the 1920’s and the Sunday School Room in 1938 – I have the copper memorial plaque to the opening of the SS Room. Other members of the family (Smith, Munt, French & Hunt) were workers in the Hat Factory next to the Chapel, on the railway or as agricultural workers, when the Chapel was built.